In the recent past, this blog has gone black for multiple reasons, most of which I plan to rectify. It is not that things have not happened worth sharing, but I seem to have that desire to always wow, always sound “deep” and profound resulting in superfluous, poorly edited posts. So, henceforth there will be many posts on personal muses and random brain cobwebs in an effort to keep this blog fluid and alive. I hope you stop by. Today’s thought is “Darkness!” que scary movie sound effects. I know that sounds grim and “unchristmasy” but stay with me. Last night, in lou of the eminent Christmas caloric gorging, I went for a hike to at least make a dent in the upcoming gut distention. Rocky gap state park is one of my favorite places ever, it was there I first mountain biked, Kayaked, camped, did a triathlon, hiked to name a few, so it has a soft spot in my heart. As expected during this time of the year, it was already dark at 5:30pm when I set out. I had my down jacket, insulated gloves, beanie, headlamp, and Eureka 300lumen flashlight. It was spitting rain and mist rose out of the lake, which the trail circumnavigates. Getting on the Overlook trail, I was immediate accosted by a thick fog, the beam of my headlamp was obscured by the haze of moisture in the air. I could actually see better with my lights off, so I turned it off and walked in darkness. My eyes slowly adjusting to the darkness, I am a little afraid but I also experience a mixture of heightened awareness and ease slowly wash over me. My mind begins to open up, thoughts unravel, it seemed the woods are alive and they listen in, old tree and I, we listen in. We now seem parts of the same mechanism in fellowship together before a sleeping sun. Surprisingly I recognize he familiar feeling of nostalgia, I have felt this way before. I felt this when as a young boy I would go the village in Imo state, Nigeria with my family for Christmas. There was always something different about the darkness there, something more natural, more inviting even. It was not just darkness that came with the decent of the sun beyond the horizon, it was darkness that was born out of a palpable powering down of people who had done all they could do for that day. It was a more peaceful darkness, one peppered with soft voices of neighbors, ancient distant lullabies, and occasional cacophonous ramblings of the village drunk. Darkness in urban settings seem to come with a forced edge to it, it seems artificial…expected. It is expected that by 11 all lights should be turned off, children tucked in, music turned down and gates locked. Darkness does not seem to bring about a gradual unwinding rather it commands a shutdown. Today’s darkness brought with it, the chatter of birds bedding down, crickets creaking or rodents rustling. 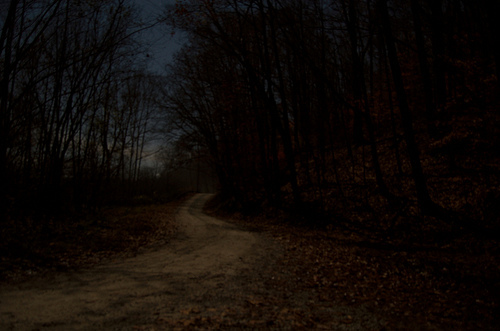 I walked quietly, lost in thought, being one with the trail and welcoming the darkness.